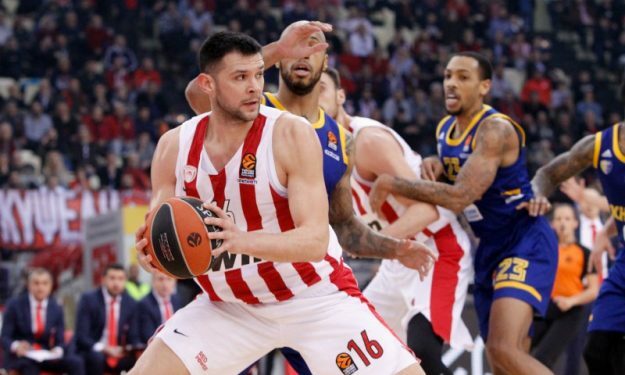 Olympiacos forced Khimki Moscow to its poorest scoring performance in the 2018-2019 EuroLeague to take a 71 – 57 win in Piraeus and improve its record to 12 – 7. For Khimki, that shot with 6/24 from beyond the arc, this was the 12th loss in the regular season. The Russian side also had its second-lowest offensive output in the history of the franchise, following a 54-point game vs. Cantu in 2012. The two squad had a horrendous first-half output since they went to the locker rooms with the score 32 – 22. After the break, Olympiacos‘offense became more fluid and the team translated its stops to points on the other end to build a 20-point lead, 48 – 28 in the mid of the third quarter following a 3-point bucket by Kostas Papanikolaou. Papanikolaou was the top contributor of Olympiacos on both ends with 14 points and six rebounds. Sasha Vezenkov had a season-high 14 points with 2/3 triples, plus the basket for the 64 – 50, in a moment when Khimki attempted some sort of a comeback to cut the deficit into 12 with four minutes left to play. Nikola Milutinov added 13 points and seven rebounds for the Reds. Jordan Mickey was the one player of Khimki that truly stood out, finishing with 21 points and seven rebounds. Only Tony Crocker (10 points, five boards) scored in double figures from his teammates in a night where almost nothing worked for Giorgos Bartzokas’ squad.